This past week I have been very busy! I've been slacking off and not getting things done at a good time. But this week I told myself that I'd start getting organized and stop slacking off. Well...it's a work in progress. But I have been writing down what I need to do everyday! For example...I've been writing in the "Notes" section of my iPhone and jotting down my day before I go to sleep. Then when I wake up it's all there! Sometimes like the other day because it was nice outside I got sidetracked so I allow myself extra time to finish things. SIDETRACK - Jenn, Taylor, Cam and I went on a walk around campus and it was such a beautiful day! Then it started to rain and thunderstorm by the time we came back! So random! We just about saw every type of weather that day! Well...two days later after actually writing what I wrote above because I've been so busy! My school put on a fashion show! I was in it and had so much fun! I really miss my modeling days! The clothes were so cute especially the one's from BEBE! Disregard Jenn in the white dress she was in the second scene. haha! 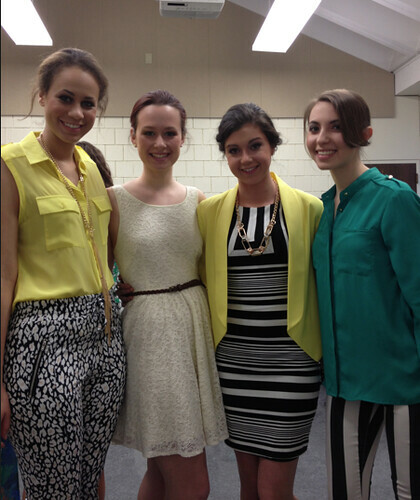 But nevertheless I had an awesome time and I can't wait till the next fashion show to come! That one I'm also going to be having some of my designs in it! So exciting! Right now Taylor and I are trying to finish our essays for english class on Oedipus Rex...welcome to the struggle life of the 2 am common room club! But it must get done and it will! Tomorrow's going to be a busy day! 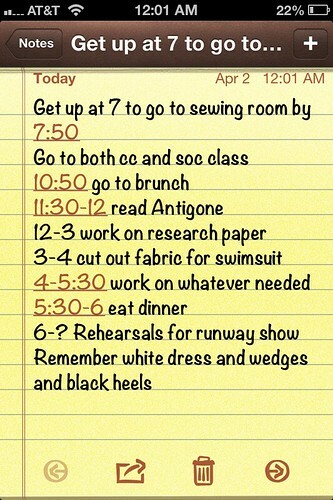 So hopefully I can get everything done as quick as possible! I need to sew a bathing suit and I have a department meeting at 6. I love being busy but sometimes it can get crazy! Oh! Can you believe I thought I ordered a pair of Nike sneakers last Monday but I just checked my history and they weren't on it! So I guess I have to order them again! Ugh...Lizz problems...Welcome to my life. Your fashion show outfit is so cute!